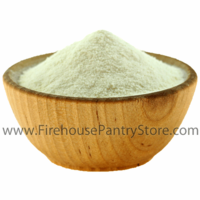 Product Details: Dehydrated sweet cream buttermilk is a kitchen staple and comes in handy when making pancakes, muffins, cakes, cornbread, battered fried foods, and so much more. Shelf-stable; no refrigeration required; great for emergency food supplies, camping, RVing, boating, and hiking. 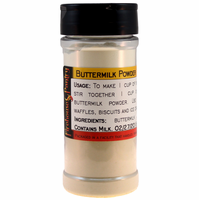 Reconstitution Directions: When a recipe calls for 1 cup liquid buttermilk or sour milk, use 1 cup of water and 1/4 cup buttermilk powder. Ingredients: buttermilk solids, whey solids. Contains milk. Packaged in a facility that also handles wheat, milk, soy, egg, sesame, peanuts, and tree nuts. Nutrition Facts: Click here for data per 2 Tbsp. serving.